Fruit Flavor Flakes – oh, what a relief it is! I’ve been doing these “recipe reboots” because, although I made them already in my first go at the Project, I had no notes or photos, and they didn’t turn up in the Wayback Machine, so I felt honor-bound to make them again. Also, for the sake of completeness, I wanted to have posts and photos from all of the recipes in the book. Normally this is a little annoying, for reasons that I expect are obvious. Then there are times like this, where a recipe is welcome because of the contrast with the previous week’s culinary caper. Fruit Flavor Flakes is simply a presentation method for plain Jell-O. 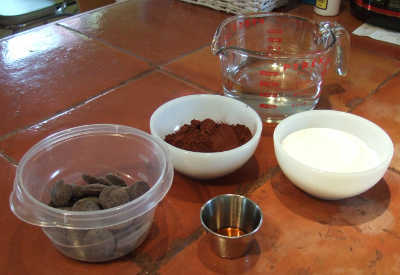 The recipe, such as it is, consists of directions for preparing a three-ounce package of Jell-O, any flavor. (I chose a box of Melon Fusion that I had in my stash – and it wasn’t even past its use-by date yet.) This is chilled until firm in a shallow pan and then “flaked”, either using a fork or by pressing through a potato ricer or wide-mesh strainer. I don’t have either of the last two things, so I used a fork, which was oddly satisfying. The flaked Jell-O is then piled lightly in dessert dishes, and may be garnished with whipped topping and/or fruit if desired. That’s it. Bryan remarked, sarcastically, that it tasted so much better forked. Well, screw him if he can’t enjoy the simple things in life. After last week’s Green Goddess Salad Bowl of horrors, the simplicity of this recipe was beautiful. Suddenly, without the addition of ingredients like mayonnaise and anchovies, plain Jell-O became tasty, light and refreshing. It was pretty the way it sparkled in the glass dish. It was the perfect foil for whipped cream from a can. Even better, it took next to no time to make, with the bare minimum of ingredients – although I did make a quick (parking meter, one quarter, twelve minutes) excursion to China Fair to pick up some new glass dessert dishes. I think I really needed a break this weekend. I think we all do. As I write this, Hurricane Irma is working its way up Florida, even as recovery efforts after Hurricane Harvey in Houston are in early days, and I just got a text from MIT that there’s been a shooting in Tech Square (about a mile from Freak Mountain). I can hear the sirens. I’m starting to lose track of all the terrible things the Trump administration is doing. Originally blogged on September 3, 2009. Since Cubed Gelatin is really more of a technique than a recipe, and since I already did it with Jell-O per the book, I decided to deviate from the script a little bit by devising my own gelatin flavor. I had been intrigued by the idea of making my own jelly* flavors after seeing this video of chef Heston Blumenthal creating jelly desserts for a Victorian feast (a link sent to me during the original Project), and here, finally, was the perfect excuse. The little front yard at Freak Mountain has a healthy and prolific mint patch** that’s grown up around my Julia Child roses, and I thought that would make a refreshingly subtle flavor for gelatin. 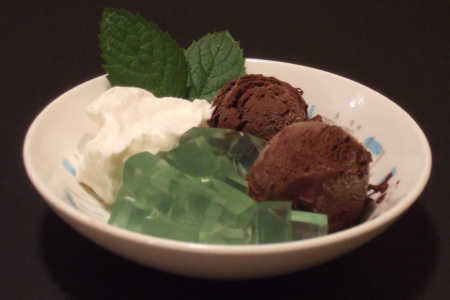 Cubes of mint jelly sounded a little plain, though, so I hit upon the idea of serving it with a chocolate sorbet and whipped cream. That way, no matter how the jelly turned out, we’d get to have something nice for dessert. Feeling a little more confident about the sorbet, I started on that first. The recipe I used is from The Perfect Scoop by David Lebovitz, and it’s insanely easy – six ingredients (including a pinch of salt), a quick boiling, melting of chocolate in hot liquid, a brief whiz through the blender (the most dangerous part), and then an overnight chill before running the mix through Bryan’s fancy gelato machine. And on to the jelly. I had done a little internet research that left me thinking maybe the process would help me to better appreciate the convenience of Jell-O. Web pages talked of the necessity of “blooming” the powdered gelatin in cold liquid, and I guess it sounded kind of like working with yeast, like maybe I could kill it somehow. Also, I wasn’t entirely sure how I was going to get the sort of flavor I wanted, and research online wasn’t much help, because it seems like most of the people making their own jellies are health-food nuts who want “non-junk” versions of the Jell-O they loved as kids, so they’re using fruit juice. A possible solution appeared in one of Bryan’s cookbooks, in a recipe for mint jelly (in the Yank sense, a clear preserve used for spreading on things like toast). The primary ingredient of that recipe is mint tea, so I decided that I would make a strong tea, goose the flavor with a tablespoon of créme de menthe, and sweeten with a tablespoon of sugar, more than I would add to mint tea for drinking, but not a lot more. Luckily, using the Knox gelatin is pretty straightforward, one little envelope per cup of liquid. To be sure I would have enough liquid, I simmered a good-sized handful of torn fresh mint leaves in a quart of water for (pardon me if I’m getting too technical here) a while, until I judged that I had a good, strong tea. Then there was the matter of the blooming. I took a cup of the tea and quick-cooled it in a retro aluminum tumbler in an ice-water bath, poured the cold tea into a bowl, and sprinkled the gelatin (which had been mixed with the sugar per one internet source) over the surface of the water. After it had stood for a minute, it had formed what appeared to be a loose gel on top of the tea, and it looked like I was on my way. I added the hot tea and créme de menthe, and after a good stir the gelatin and sugar had dissolved, so I poured it into a very lightly greased square baking pan. So far, so good. No hassles with the gelatin, the color was what I was trying for (a cool, pale green). The only possible problem was that under the minty fresh scent, there was a funky odor from the gelatin, and I began to wonder if Jell-O flavors have all the subtlety of a car crash for a good reason, because otherwise the odor and flavor of the gelatin would be detectable. Well, I would find that out in a day or so, wouldn’t I? The next day, after yoga class and dinner and watching all the extras on the Galaxy Quest DVD, I got down to the interesting business of plating and photographing a frozen dessert on a summer evening. (First I had to hunt up the tabletop tripod for the camera, which I had put away in a closet after shuttering the original Project.) As they say, fortune favors the brave, and the shoot worked out better than I expected. I never doubted the sorbet, but I have to say the mint cubes met or exceeded my expectations. In particular I think the color was perfect, and it looked very nice indeed with the dark brown sorbet and the whipped cream. Of course, the proof of the pudding is in the eating, and I have to say the whole thing was pretty good. The chocolate sorbet was incredibly rich, with an intense cocoa flavor, like if it turns out that there’s chocolate pudding at the buffet in Heaven, it probably tastes like this sorbet. The mint cubes had neither a funky smell nor taste of plain gelatin; instead, they were purely minty fresh. Bryan and I agreed that the flavor could have been stronger, and maybe a little sweeter, but overall it was not bad for a first effort. The main thing that struck us was that the texture seemed firmer than regular Jell-O, which I will bear in mind for future reference. Granted, jelly and ice cream are an odd pairing, but the cream tied it all together fairly well. I think it could have used something crunchy, through, maybe some nut-cookie crumbs, or tuiles. I brought the leftover mint cubes to work with me today, and got a couple of people to try a cube. There was no disgust, but their responses confirmed that the flavor was perhaps a tad too subtle. Still, I ate the rest for dessert at lunchtime, and it wasn’t a chore. It was refreshing, and the lingering real mint aftertaste was straight up pleasant. I’m encouraged by this, and will definitely be trying to concoct other flavors in between bouts of the Jell-O “salads” to come. * I will use the term “jelly” in the British sense, to distinguish my experiments with unflavored gelatin from anything made with a Jell-O brand gelatin product. 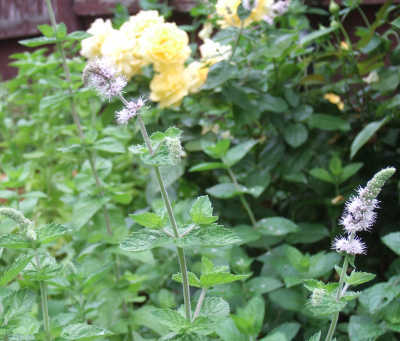 ** A few years ago, we planted some mint in a pot and, true to form, it escaped.